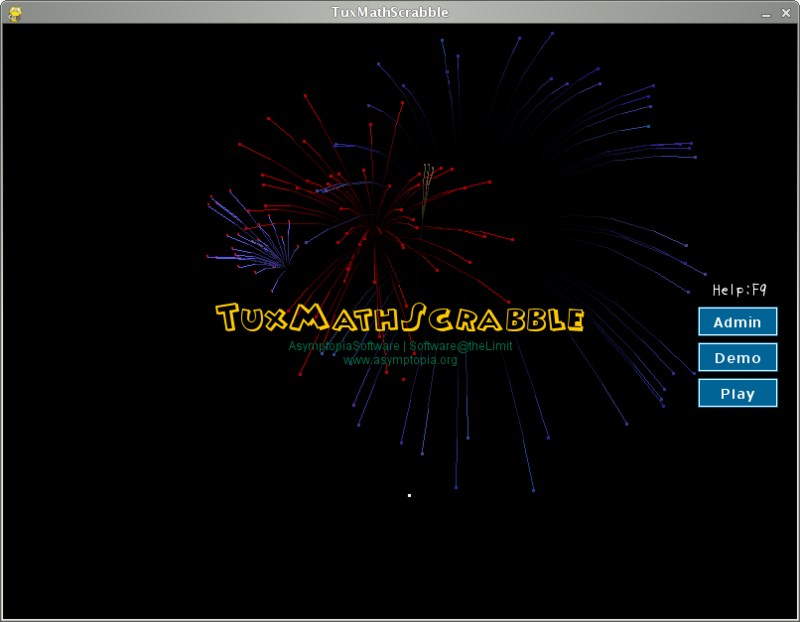 TuxMathScrabble is a math version of the classic word game "Scrabble" (Trademark of Hasbro,Inc) which challenges kids to construct compound equations and to consider multiple abstract possibilities. There are four skill levels for practice, from basic addition with small numbers, through multiplication and division with larger numbers. The game can be played by 0, 1 or 2 human players. Player submissions are made by dragging tiles to the gameboard and pressing the "okay" button when ready to be validated. Invalid submissions are thrown-back to the user's tray. 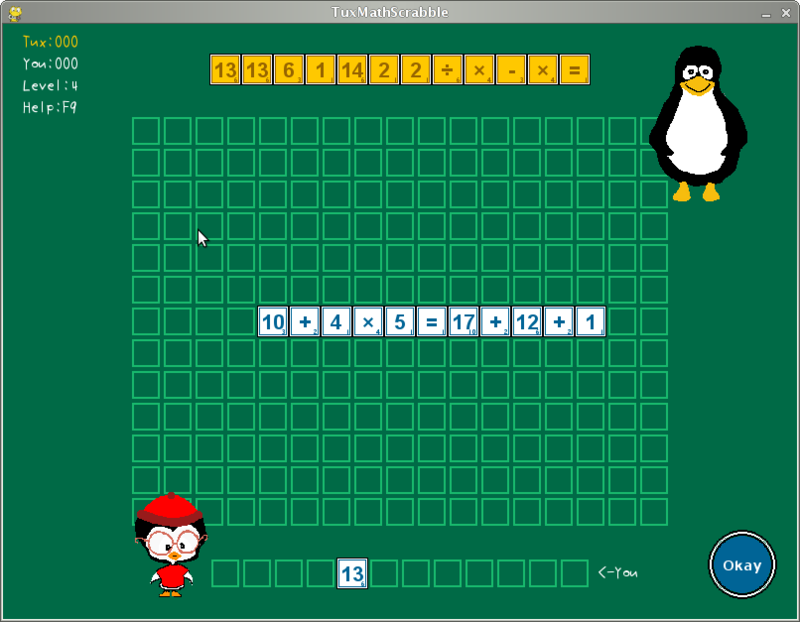 Several new features have recently been added, such as the ability to shuffle player tiles in-place, the programatic creation of tiles on-the-fly (as opposed to using images), configurable tile transparency, the ability to use a background image, and the option of configuring the "None" character for either/both players. Or press ALT+F2 on your desktop (or go to a terminal like gnome-terminal and konsole), type TuxMathScrabble, and press Enter. 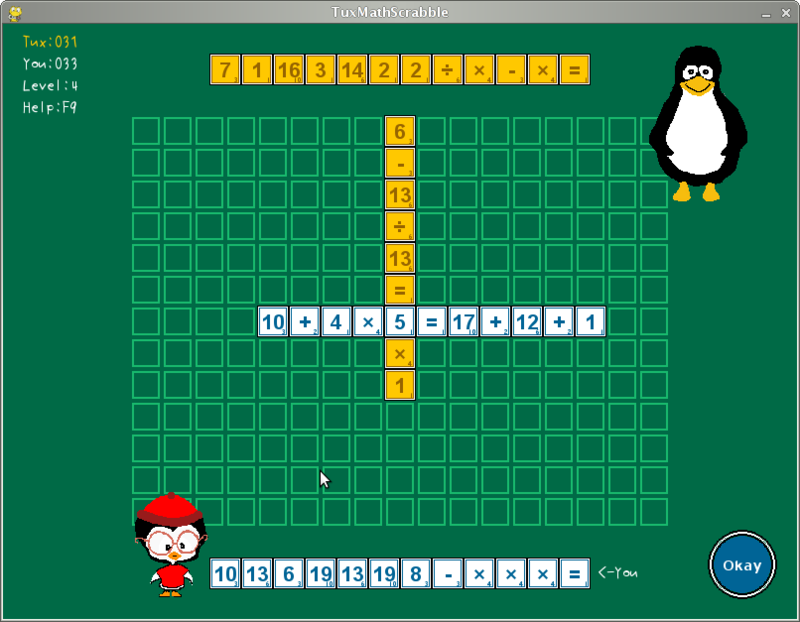 After starting the game, click on Play and drag tiles to combine an equality which can be read either across or down the gameboard. When submission is ready, then press "okay" button to validate it. Invalid submissions are thrown-back to the user's tray. Valid submissions are scored. Then play passes to the second player who combines its own equality and so on. The game ends when both players can't combine new equality for three turns in a row. The default skill level is 4 (the hardest level with all four arithmetical operations and upper numeric limit of tiles equals 21). You are able to just start the game and play, but if you're willing to tweak the game, then there are two ways to go: The Admin button in the game and the configuration file located in $HOME/.config/TuxMathScrabble (where $HOME is your users' home directory). This page was last modified on 16 July 2010, at 13:31.